WHAT MY CONTRACTOR DID FOR ME: Installed attic ladder replacement. WHY I CHOSE HIM: Professionalism. I’ve been thinking about this project for a long time … since we moved here back in 1978. We have a garage with a small attic over it, which we use to store suitcases, Christmas things, Halloween decorations, seasonal stuff like that, plus a few other things we very seldom use. We’ll be bringing out the Halloween things soon enough. 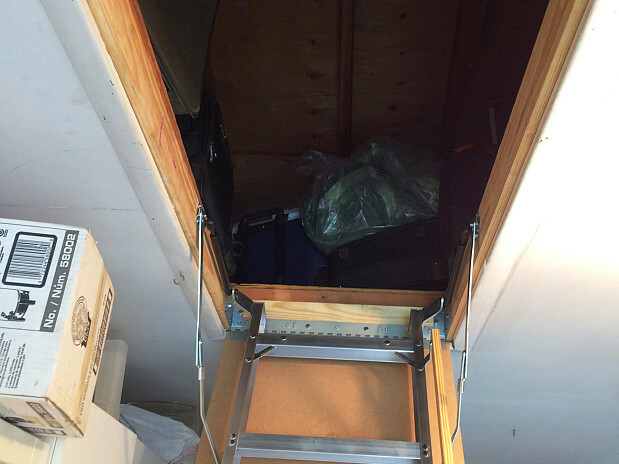 To get to the attic, there was an old pull-down wooden ladder. The ladder never looked terribly sturdy to me but over the last few years it was getting more and more creaky. Every time I’d go up there, it would make these loud noises like, “Eeeeeek!” I’d tighten all the bolts, but it really didn’t seem to help; the wood was probably drying out due to its age. 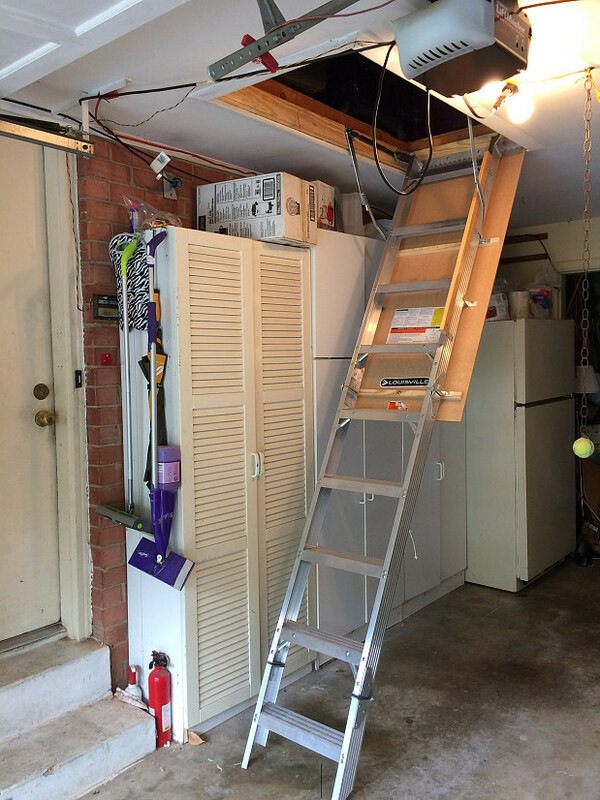 I really didn’t want to die climbing a ladder in the garage, and finally I decided that I just could not go up there anymore without replacing it, so I went to Lowe’s Hardware and bought the ladder. For help with home improvement projects, if it’s something like redoing a kitchen, we’ll talk to neighbors and see what they’ve done. We also have a neighborhood email list so we can check that way and see who’s had good experiences. I had had a hard time finding somebody who would do this kind of work, though, because it’s not exactly a standard job. So I went online to a contractor referral service. After I filled out my requirements and posted a couple of pictures, I got 3 calls from contractors within a few minutes. It was amazing. There were so many possible categories but I could not find anything like replacing an existing ladder, so I knew I needed to use someone who’s handy at all things. I chose Humberto's Home Remodeling, LLC because he sounded more professional than the others. When I called him out, he knew what he was doing right away. The only surprise was that when he actually saw the job, he explained why it was going to cost more than he had estimated over the phone. And that was very reasonable. The problem was that the people who installed the ladder the first time had used a standard-sized ladder, but the hole they put in was about an inch too wide, leaving a gap. 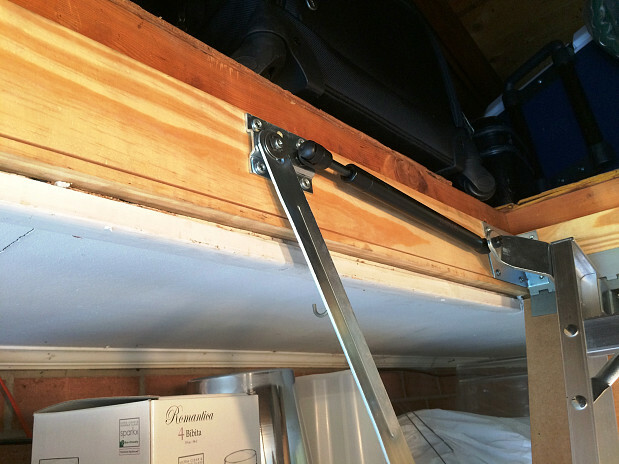 As a result, even the original ladder had always been held up with bolts going through back and forth, and all the weight on the bolts, without any side pressure. So Humberto had to add some wood and rebuild the hole to fit the ladder exactly. He and his helper worked for 4 or 5 hours solid. They had to take the wooden ladder down first and then use a tall stepladder they’d brought with them as their base of operations. It was not an easy task because it was located above head height, and the ladder is not light at all. I had looked online to see how to do this and it was definitely a 2-person job. I can do a lot of things around the house, but that was totally beyond what I could do, but Humberto and his partner somehow figured it out. I was very satisfied with everything he did and with the fabulous service. Climbing the new ladder is just like going up a staircase, not the death-defying act it used to be. Make Your Remodel Work With Great Ideas And Pro Construction by Shirley S.